Discussion in 'News & Rumours' started by Imagineer Josh, Jan 7, 2017. Well "leaky" what we have here. To seek out some more information, I decided to ask Interlink (used ride online store) about it, and what could they have said? 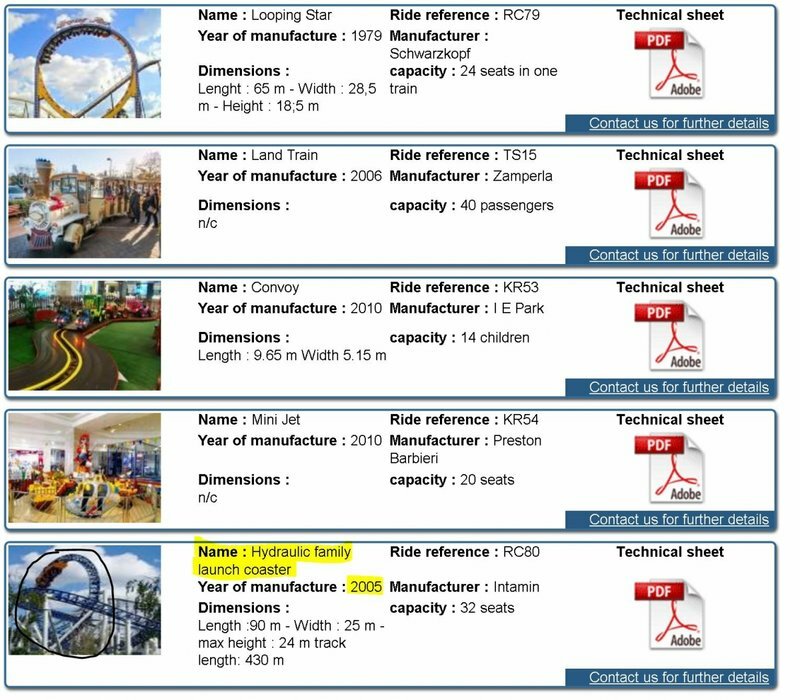 Look at Interlink - http://www.interlink-lg.com/occasion.htm It's at the very bottom as "Hydraulic Family Launch Coaster"
It may not be the best received ride in the world but it will be a really really good addition for where it is going. Wait, not well received? I liked it better than Rita, Stealth, Speed Monster, Baco, Ka... And Dragster! So pretty much Storm Runner and Xcelerator are the only two I've ridden I liked more! That being said, let's hope it ends up at Fun Spot! Hopefully (for entirely selfish reasons) it will stay in Europe. I still need the cred. But as long as it stays out of Brasil (where major parks seem to be buying coasters for their storage sheds, rather than to build them), everything should be fine. Well that's just mean RoomRaider!!! At least give us a clue, RoomRaider ha. Well I hope some small park somewhere gets a nice boost from adding this as their first "major" coaster. As enthusiasts that's always satisfying to see. Don't be such a tease Roomraider. It was a lovely Christmas present! Just about fits in my garden. Just tell us the country at least. Or even the continent? What year is it opening in? Ughhhh. I really shouldn't post when I've crawled in from a night out completely legless. I sound like a right spanner. If anyone sees last night be give me a slap please. It's off to the states from what I've seen. Still working on confirming the park though i have a decent idea. CoasterMac305 and Will like this. Isnt Kentucky Kingdom supposed to be adding in another coaster between the 2018 and 2020 season basrd off their initial plans? Id guess there as it would give them back their launched coaster and standard looper that isnt their SLC. But again, I still vote for Fun Spot! ^ Dorney has a regular used-rides-row now between Stinger, Possessed, and Demon Drop. Dorney is like Six Flags America in that all their used rides come from other parks in the chain. I don't see this going there, but I wouldn't mind seeing it in Maryland. Any update on that location, roomraider? Just gonna throw it out there and make a crazy prediction: Adventuredome. My prediction would be Kentucky Kingdom to be fair.